Adequate oral hygiene is more than just eliminating bad breath. Practicing the right techniques can also help your child remain healthy, pain-free and feel more confident about themselves. Parents need to be adept when it comes to proper brushing techniques to work on with their little ones. The habits you teach your kids will likely stay with them the rest of their lives. It can be challenging to unlearn habits that we pick up before we are old enough to know why we do them. Brushing alone won’t keep your child’s mouth completely healthy though. While tooth brushing is necessary, it only cleans about 1/3 of the total tooth surface area. Flossing is an absolute necessity if you or your child are to have a healthy smile for years to come. Try to brush with them two times a day and if possible floss each time. Just make sure you pick a time to floss that can be done consistently every day. You can help your child prevent a host of lifelong oral ailments by showing them that flossing and brushing every day is just a fact of life. Remember to always lead by example. Kids, infants and every other age in between will follow the direction of their parents. By continually ensuring that you as a parent are following great hygienic techniques and procedures you can undoubtedly encourage your child to do the same. It is imperative to reinforce proper oral care for children when they are still in the midst of premature age. By starting these oral practices early on, your child will form a habit that will benefit them for the remainder of their life. Bad Breath – Throughout the day, food can get easily stuck between their teeth. This provides a breeding ground for unhealthy bacteria to multiply and thrive. The buildup of bacteria will not take long to emit a foul odor. If your child has bad breath that smells not far off from rotten eggs, then they may have excessive bacteria buildup due to a lack of regular flossing. 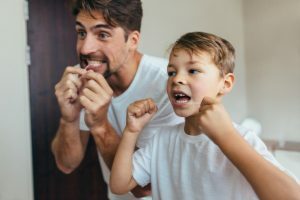 Bleeding Gums – Despite what many of us have heard from our own parents, bleeding gums are not an indication that you are flossing correctly. There is never a time when it is normal for gums to bleed. When improper oral hygiene goes on long enough, the gums become swollen due to infection and will bleed easily when brushed or flossed. Bleeding gums are often an early indication of gingivitis, otherwise known as gum disease. It’s important to minimize the growth of bacteria by flossing so that your child does not become susceptible to gum disease later in life. More Openings For Your Busy Family! We try to make visiting the dentist as easy as possible, so our team of doctors splits their time between two offices; one in Carmel, and one in Indianapolis. We know how difficult it can be to get the whole family into the office during regular business hours, which is why we have opened our scheduling from 7am to 7pm on Mondays in Indy and Wednesdays in Carmel. Schedule A Visit For Your Family Today! Please feel free to contact us at your earliest convenience to schedule your next visit! Our friendly staff would love to help you out! For our new patients, we have opened up online access to the necessary forms so that you can get back to your day with minimal delay. Here at Newman Family Dentistry, our goal is to take the stress out of your family dental appointments!